Hurling is riding the crest of a wave at the moment in terms of popularity as the two magnificent semi-finals had people hooked all the way until the final moments of Galway's narrow replay win over Clare. While claims that football has added to this are subjective, it's clear that hurling is enjoying a good summer as we tick towards the All-Ireland Final on Sunday. So it was the perfect time for Barstool Sports to try and discover a bit more about one of our native sports. Their reporter Donnie discovered the game on a recent trip to Ireland and set about finding out more about the game in Gaelic Park in New York. Hurling is my new favorite sports and I’m not just saying that because I’m disgustingly good at it. Donnie Does Hurling link in bio. Donnie even told a great story about his encounter with the old man in charge of the gate at Gaelic Park. "I had an incredible day at Gaelic Park despite the old man in charge of the park not wanting to accept this as a press pass because he didn’t know what twitter was. 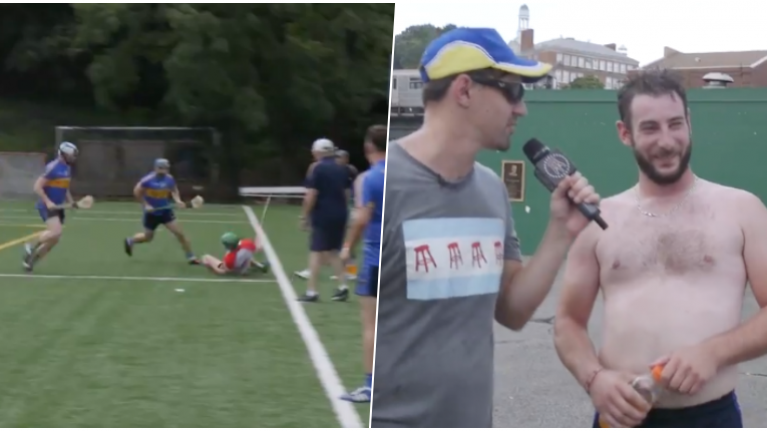 "I tried telling him we were filming for Barstool Sports because we wanted more people to learn about the sport of Hurling and he goes 'How am I supossed to know who you guys really are? You could be perverts for all I know.'" Below is a brief clip of the short video he made for Barstool Sports, but you can check out in its entirety here. You'll definitely recognise a few faces from the video. Nothing quite like a #hurling fight. Definitely gonna use “you don’t know where yer fooking from!” in my next altercation even if the person does indeed know where they’re from. Don’t worry though, it ended up just being #handbag stuff. Full vid link in bio.